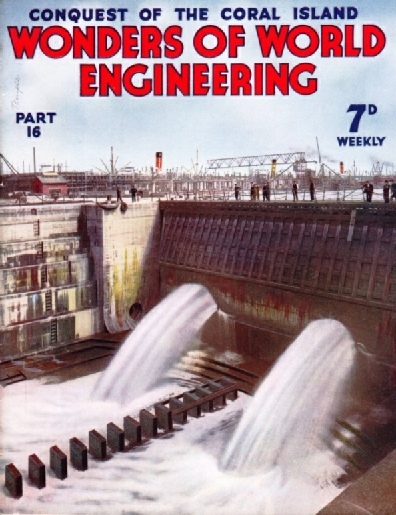 Part 16 of Wonders of World Engineering was published on Tuesday 15th June 1937, price 7d. 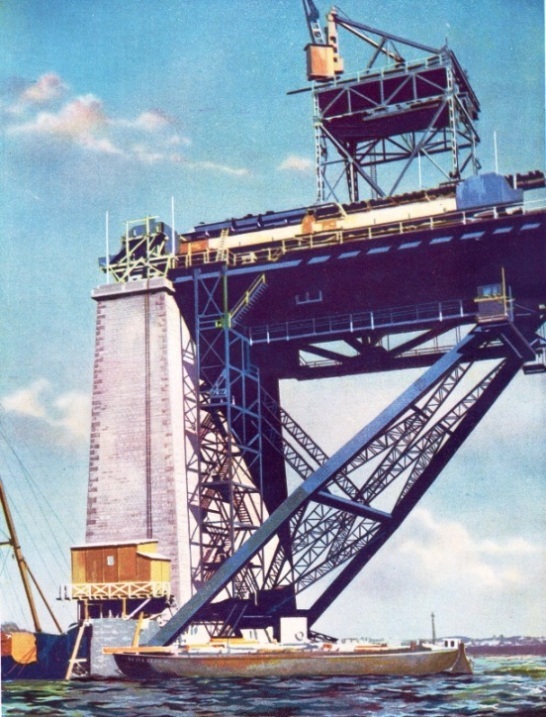 Part 16 includes a colour plate showing the Little Belt Bridge. It formed part of the article on Great Danish Bridges. 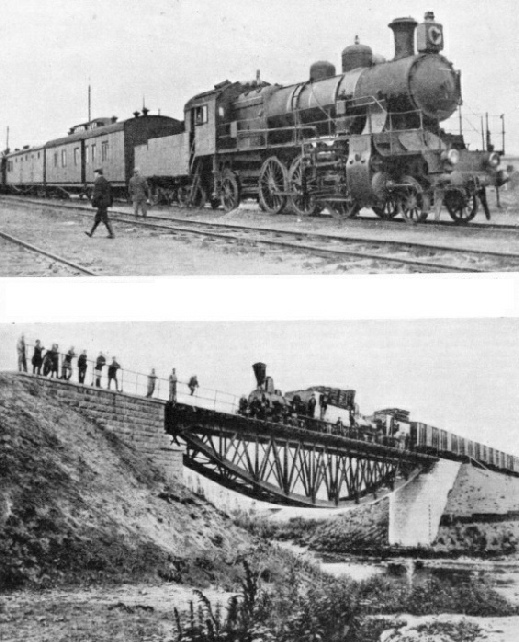 The story of how engineers at last succeeded in linking East and West with a steel highway across the largest stretch of unbroken land in the world. The article is by C Hamilton Ellis and is concluded from part 15. 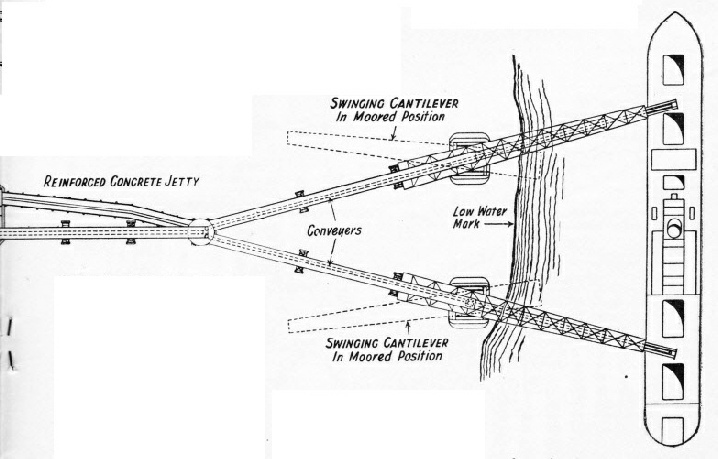 It is the fifth article in the series on Railway Engineers at Work. You can read more on the Trans-Siberian Railway in Railway Wonders of the World. Many of the coral islands in the Pacific and Indian Oceans contain valuable deposits of phosphate. On Christmas Island, Nauru and Ocean Island engineers have built special plant which facilitates the speedy loading of ships in difficult conditions. There are more natural resources on these islands than is generally known, and engineers have evolved various types of plant to acquire and ship these natural deposits. This chapter tells how phosphates and other natural deposits are extracted and shipped from the Pacific island of Nauru, Ocean Island and Christmas Island. The greatest difficulty the engineers had to overcome was how to load the ships with the phosphates acquired from the islands. These coral islands have no natural harbours and are very exposed, having only a slight elevation above the level of the ocean. Nauru, for instance, is surrounded by a reef about 400 feet wide, which is dry at low tide and covered at high water to a depth of about six feet. Road and rail communications in Denmark are interrupted by numerous straits and other waterways which have to be bridged or ferried. 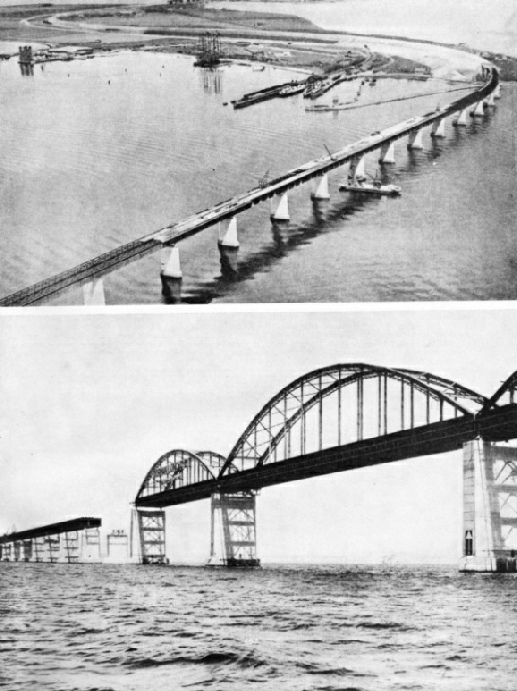 The Little Belt Bridge and the Storstrom Bridge are recent examples of the surmounting of difficulties in crossing arms of the sea. 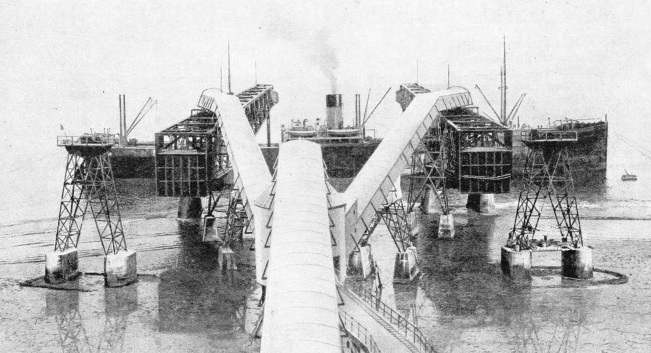 In this chapter C Hamilton Ellis describes the building of some of the largest bridges in Denmark. Denmark comprises a peninsula and numerous islands divided by sounds and other waterways, and bridges are vital links in the country’s communications. A strait known as the Storstrom is bridged by a structure which has a headway of more than 85 feet in the central spans. The Storstrom Bridge was only recently completed by a British firm of engineers, and is undoubtedly one of the most imposing bridges in Europe. 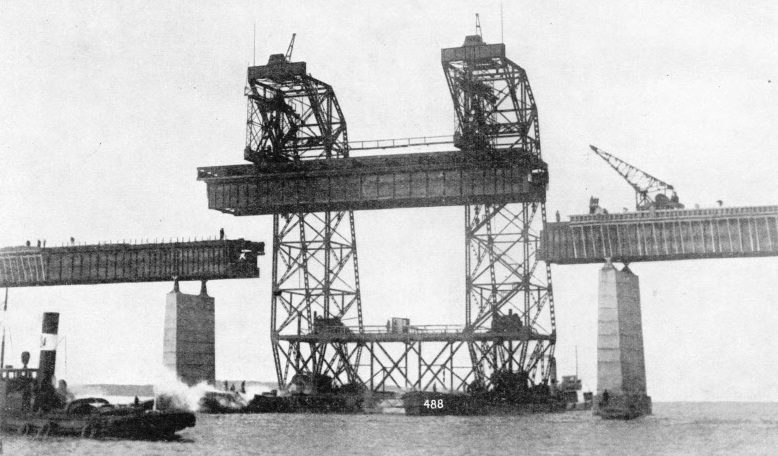 A vital link in the main road and rail route between Copenhagen and Jutland is the bridge across the waterway known as the Little Belt. One of the interesting features of this bridge is that unconventional methods were used in all the underwater foundations for the piers. The chapter is concluded in part 17 and is the fifth article in the series Linking the World’s Highways. 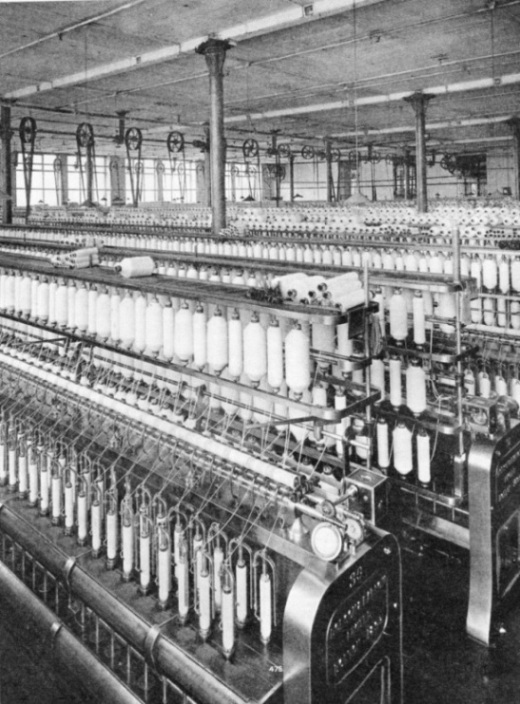 The Lancashire cotton industry owes it existence mainly to the engineers who evolved the ingenious machines that carry out the complicated operations of spinning and weaving formerly done by hand. This chapter is by David Masters and in addition to describing the cotton mills of to-day, it shows how that great industry was built up on the works and inventions of Arkwright, Hargreaves, and other early engineers. The first of these engineers was born as early as 1704. His name was John Kay, and in 1733 he patented what is called the fly shuttle. This invention enabled the weavers’ output to be doubled, but the invention brought Kay no good. The weavers themselves were of the opinion that, because the fly shuttle enabled them to produce the same amount of work in half the time, there would be sufficient work only for half the number of weavers. They gathered together and wrecked Kay’s weaving shed and everything in his house. 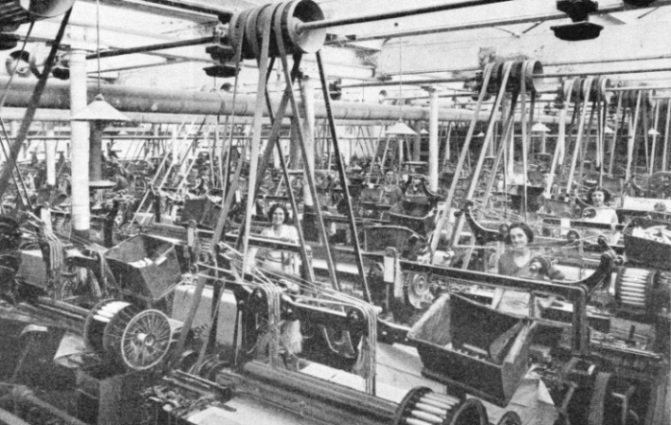 The weavers and cotton workers at first were the main opponents of the introduction of machinery, and James Hargreaves, the inventor of the spinning jenny and the carding machine, met with no better treatment. Samuel Crompton was another engineer who contributed to the advance of the cotton industry. For long he worked secretly to try to make a machine that would overcome the difficulties involved by the continual breaking of the thread in the process of spinning. After five years he produced a machine called a mule, which obviated such breakages. Finally, Richard Arkwright made his contribution to the industry, and, when Edmund Cartwright had supplied steam power to the weaving process, the Lancashire cotton industry was fully equipped for the enormous advance it made in the next hundred years. This is the third article in the series on the Romance of Industry. “AUTOMATIC LOOMS are among the most amazing machines in industry. They stop if a thread breaks, and the shuttle is automatically recharged with a full cop, or reel, from the wheel-shaped magazine seen to the right of each loom. The shuttle, too is automatically threaded. rotor shaft, that is, of the heavy shaft on which are mounted the blade-carrying disks. These shafts, which have to spin round at high speeds, are subject to heavy stresses when working, and at every stage of their manufacture have to be minutely examined and subjected to numerous tests. The forging is first carefully heat-treated to remove any internal stresses set up in the steel during its passage through the press. Next, pieces are cut from it; some to be pulled apart and others bent almost double to determine lf the metal is of the required strength. Then, when the forging has been turned in the lathe, the surface is gone over with prepared paper and what are called "sulphur-prints" are taken from it. These show up any defects in the structure of the metal and, if any non-metallic inclusions are found, they are carefully removed and the place is afterwards scrutinized through a lens. The outside of the shaft having been found satisfactory, the condition of the metal of the interior has to be investigated. A hole is bored right through the centre of the shaft by a trepanning tool which removes a cylindrical core. This core also is sulphur-printed and examined. Test pieces are taken from it, not because it is to be used, but to find out if the forging is reasonably uniform all the way through. 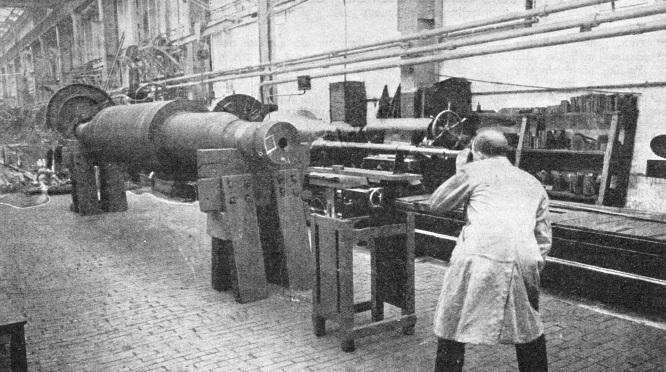 The task of examining the inside surface of the hole is next carried out with an instrument called a "Borescope", made by Sir Howard Grubb, Parsons and Company. cracks, even if so fine as to be invisible, the powdered iron gathers thickly on the edges of the cracks and defines them. In the electric test a current is passed through the shaft and the difference of potential along its length is measured. If there is only a small drop in potential the forging may be considered sound. A final test, carried out when the disks are in place, consists of spinning the shaft round by motor at a speed of 20 to 25 per cent above its normal running speed. This test is performed in a strong chamber resembling a bomb-proof shelter, without anyone being present. Measurements and examination are made afterwards. This is the ninth article in the series on Modern Engineering Practice.